My love for tactical games back in the 90s was limited to traditional PC style strategy games like Romance of the Three Kingdoms, with their complicated interfaces, and the board game, Risk. So when Sega released Shining Force: The Legacy of Great Intention in 1992 with its streamlined mechanics, it quickly became one of the biggest reasons I argued with friends for why I preferred the Genesis over the SNES (sacrilege now, I know!). I was already a fan of Shining Force’s precursor, Shining in the Darkness. Sega and Climax Entertainment fused the visual aesthetics and JRPG elements of character building from the latter with a tactical strategy framework to enact a genre switch akin to the class promotion each of the Shining Force characters can undergo beyond level 10. A lot of strategy games have faceless armies in combat against a slew of Tolkienesque enemies. One of the best decisions Sega and Climax made was that each character has a unique battle animation that plays when they attack. They express their personality through their combat style, whether it’s the Elven archer, Hans, carefully pulling on his long bow; your best friend, the priest Lowe, whose heal spells are essential for the first part of the game; the centaur, Mae, with her concentrated javelin attacks; and Tao, the sorceress who rains down fire on her foes,. On top of that, since they level up and can change professions, you directly witness their evolution. It makes the battles feel more intense and meaningful because I felt a connection with each of the members and didn’t want to lose any of them. Fortunately, the game is more forgiving than some of its contemporaries, especially Fire Emblem with its character permadeaths. Fallen comrades can be resurrected and a loss in battle only means you lose half your gold and have to restart the fight. The stages vary, from a battle on a ship to a circus against dire clowns and a demonic marionette. But the most memorable for me was the battle against a secret weapon the Runefaust discovered, the Laser Eye. In the opening cutscene of the stage, a centaur named Pelle is unceremoniously thrown off a cliff by a Silver Knight for refusing to stay on the side of Runefaust. “If you are not with us, you are against us,” he yells before knocking him to his death. This in itself serves narratively to remind the characters that if Runefaust isn’t stopped, they’ll kill all those who oppose them. Since they’ve gotten hold of a powerful secret new weapon that will definitely be used to perpetrate their evil, it has to be destroyed at all costs. The Laser Eye is a weapon used by the Ancients, a robot designed for annihilation. Stationed at the end of a long, tightly spaced, land bridge with precipitous cliffs on either side, it’s positioned in a way where its unidirectional aim isn’t a fatal flaw (as with the case of the real life Schwerer Gustav railway gun). The gun’s only weakness is that it takes time to charge up, a total of six turns in terms of actual player moves. As the countdown begins, I raced my forces across the bridge, desperate to stop it before it fired. The problem is that Runefaust forces have anticipated you and are arrayed to stop your charge. Dark Elf archers are stationed to the south of the bridge, ready to launch arrows at your party. Pegasus Knights are flying in defensive positions to the north, ready to attack in a pincer. Lizardmen impede the path on the bridge itself with Dark Priest’s there to provide magical support. Not only are you racing against time so that the Laser Eye doesn’t unleash its barrage when the countdown ends, but some of the deadliest enemies to that point are guarding the hazardous road there. Not being aware of other strategic options and intimidated by the dwindling timer from the Laser Eye’s pending Armageddon strike, I sped forward. It was one of the dumber decisions I made. My forces rammed straight into the Lizardmen. With Pegasus Knights and Dark Elves attacking, I found myself completely surrounded. Then the Laser Eye fired. At the time, I didn’t know the cannon affected both enemy and friend alike. So when the laser explosion happened, I was completely unprepared. It laid down a shower of laser beams, causing heavy damage on everyone in its wake. Subconsciously, I realized Runefaust was trying to use the weapons of the Ancients without even being fully aware of the way it worked. Either that, or they didn’t care who they sacrificed in their march to victory, even if it was their own forces. Half my force died. The other half was debilitated. Those who’d avoided the blast by stationing themselves on the small cliff south of the bridge were attacked by arrows from the Dark Elves. I used Lowe and the other healer, Khris, to try to patch up what was left of my army. But my main character perished in an attack by a Pegasus Knight and the battle ended in my defeat. It was time to rethink my strategy. The realization that the Laser Eye indiscriminately kills both friend and foe alike changed my approach to my instinctual strategy of rushing towards the weapon. Instead, I opted to wait for the first volley to fire and take out some of my enemies. There was still the issue of the powerful Pegasus Knights who were outside the firing range of the Laser Eye. They’d still be a big deterrent in the trek across the bridge. This is where the choice of your character deployment becomes important. You can get up to a total of 28 members, but only 12 can enter battle. I’d included the winged knight, Balbaroy, as part of my force. The Birdman isn’t limited by geography and can move in the direction of the Pegasus Knights. Which is what I did, getting closer but staying out of proximity. Having caught their attention, the knights gave pursuit. I led them back towards my army stationed below the range of the Laser Eye. There, my tanks, Luke (or Lug depending on the version) and Gort dispatched them with the help of my two sorceresses, Tao and Anri. After the countdown completes, the cannon fires, decimating the Lizardmen and Dark Priest on the bridge. I moved my entire force forward, finishing off any remaining enemies. The Centaurs in general have more mobility (being half-horse), but are weaker fighters. Since most of the foes on the bridge were already badly damaged, they posed little threat and I reached the Laser Eye without much opposition. The Eye itself has no defenses and goes down quickly as long as you can destroy it before it re-energizes its canon. Technically speaking, you could just wait for the cannon to count all the way down two or three times so that it can kill everyone on the bridge, then move forward. But the first blow is sufficiently powerful enough that your party should make it all the way across. Once the cannon is destroyed, the commander, the Silver Knight that had killed Pelle, is the only one left. With most of your force intact, he goes down relatively easy. As the actual victory condition for the battle is the Silver Knight’s defeat, you could also send Barbaroy to the Silver Knight at the beginning and kill him, allowing you to skip the Laser Eye entirely (though Barbaroy’s relative weakness at this stage makes that arduous). What I most appreciated about the battle was that it was one of the first I recalled where I had to take into consideration numerous aspects of battle, from timing, the geographic layout of the bridge, enemy placement, and who I took into battle as something more than personal preference. Before then, most of the battles in the game had you facing off against another army of enemies. There was some strategy involved, but it was about surrounding them and killing as many as you could. 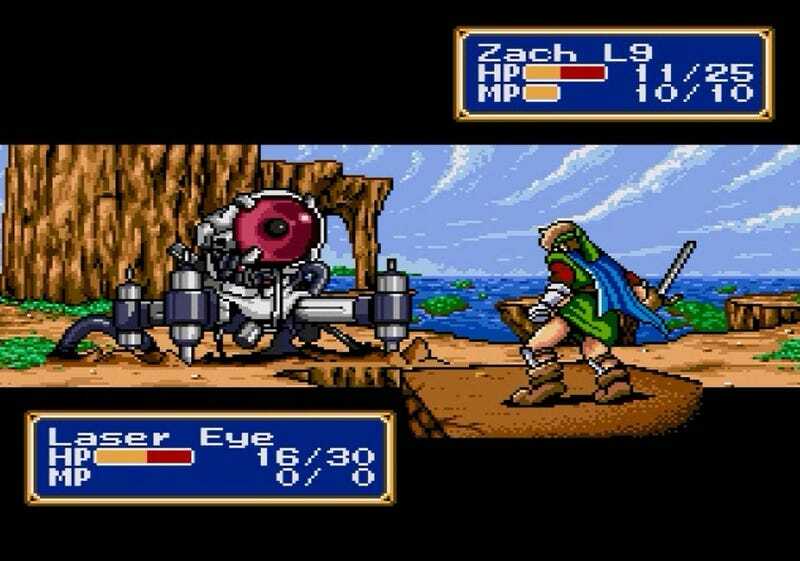 The Laser Eye battle was one of the first times where strategic movement proved far more efficacious than the Shining Force’s combined physical and magical strength. It also helped drive the story forward as it had me asking questions about the world. Who were the Ancients? How did they get hold of this superior technology in a land where swords and spears are the norm? How did Runefaust learn about this weapon? Were there more like it? The best battles don’t just have you fighting pointlessly. There has to be deeper stakes to give the conflict more meaning. When said battle can engage you intellectually and involve personal strategization, akin to solving a puzzle, then you’re truly engrossed. Shining Force’s campaign had me enthralled and still fires nostalgic memories forward to me all these years later. This is the third part of my examination of some of my favorite levels in gaming.